You chose chronic or acute gout treatment for Starting Gout Treatment Guidelines. If you have not made that choice yet, please go back to that first step in your gout treatment plan. In this step, it’s time for a reality check. How confident are you that you can stop gout pain. Can you lower uric acid without a doctor? Do you really need treatment, or can you remove the causes of your gout. See Chronic or Acute Gout Treatment summary. You might be absolutely certain about the gout treatment choices that you have already made. That’s fine! If you are certain, skip this step, and go straight to Medical or Natural Gout Treatment. Now, we can see how realistic your ambitions are. This is something you can discuss with your doctor, or other health adviser. In the gout forums, I offer personal help. When you discuss your treatment plan with your doctor, you can ask if your treatment goals are feasible. Your doctor can look at your medical history and test results. But what if you are trying to self-treat? What if you want to remove the causes of your gout instead of seeking gout treatment? Are effective inflammation blockers available to you within your budget? Are effective anti-inflammatories available to you within your budget? Are effective pain blockers available to you within your budget? Do you have treatment for other health conditions that might affect gout pain treatment? Do you have access to monthly uric acid testing? Can someone interpret how your test results affect treatment? How important is monitoring liver function and kidney function? Is your timescale for dissolving your urate burden reasonable? Have you considered the risk of gout flares until your urate burden is dissolved? Though primary gout cannot be cured, it can be controlled. I explained the two aspects of primary gout control above. Secondary gout is gout that is caused by another condition. In those circumstances, if the cause of gout is avoidable, then removing that cause will cure gout permanently. 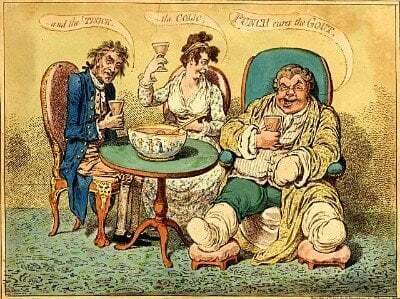 Note that most gout is genetic, and therefore cannot be cured. There are various tests and investigations that can help determine avoidable causes of gout. I cover these in my Gout Causes Plan. As such, specific checks are not included in this treatment plan. You can get help now, in the gout forum. Please ask there if you are concerned about obesity, blood pressure medicine, environmental pollutants, or other forms of secondary gout. There is, however, one important gout cures without treatment check. You must assess how long it will take to remove the cause of your secondary gout. For example, it can take several years to treat obesity. In such a case, you should consider temporary treatment for both acute and chronic gout. Choosing Chronic or Acute Gout Treatment. 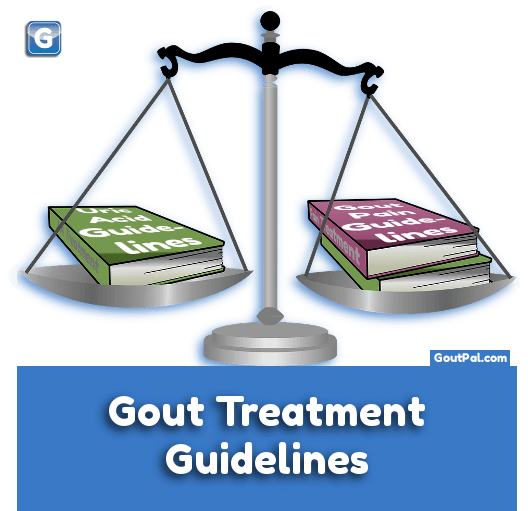 Which Gout Treatment Guidelines are feasible? In this step, we’ve looked more closely at the gout treatment goals we started with. By checking available resources, and our own situation, we can confirm or amend our goals. Next, we decide the type of treatment that suits us best. If you are not sure if your gout treatment goals are realistic, check with your doctor. If you don’t understand your doctor’s responses, ask in the gout forum. Leave Chronic or Acute Gout Treatment to browse the Gout Treatment Guidelines. TL;DR - Chronic or Acute Gout Treatment? This is a reality check. If you are certain you've already made the right choices, then skip to Medical or Natural Gout Treatment.